Mexico sits atop some positively massive quantities of shale oil and gas, but, unlike America, has not pursued these lucrative subterranean reserves. Why? According to Mexican President Enrique Peña Nieto, doing so is against the country's constitution; so he's asking the government to change it. 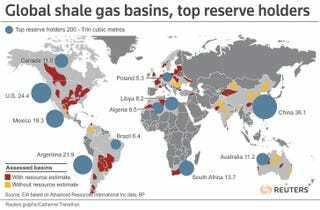 Above: The world's largest shale gas deposits. Mexico's go largely untapped. Infographic via Reuters. As it stands, the Mexican Constitution forbids private investment in Pemex. That law has been on the books since 1938, when President Lázaro Cárdenas kicked foreign oil companies out of Mexico for not respecting labor laws. But the restriction is outdated, Peña Nieto argues, better suited to a time when Mexico could count on the easy oil of gigantic, shallow-water reserves like the Yucatán's Cantarell. New techniques such as fracking and deep-water drilling are much more complicated and expensive, and Pemex needs help keeping up. Critics are taking to the streets, calling the plan a betrayal of the Mexican Revolution's progressive values. For them, Peña Nieto's plan represents a return to the economic colonialism that a nationalized oil industry was intended to combat. The Mexican historian Enrique Krauze recently wrote in the New York Times that, for many, allowing foreign investment in Pemex feels like "bargain[ing] away the country's soul." And for what? So that Mexico can have its very own Deepwater Horizon, or initiate large-scale fracking projects that can trigger earthquakes and blight people with flammable tap water? For a country that already lags behind the rest of the world in renewable energy, that could prove to be a very risky – and very shortsighted – move. For more details, check out the rest of Wade's piece over on Slate.